June brought another active month to the Panama City Beach real estate market with over $43 million in total sales volume for condos and over $34 million in total sales volume for single family homes. 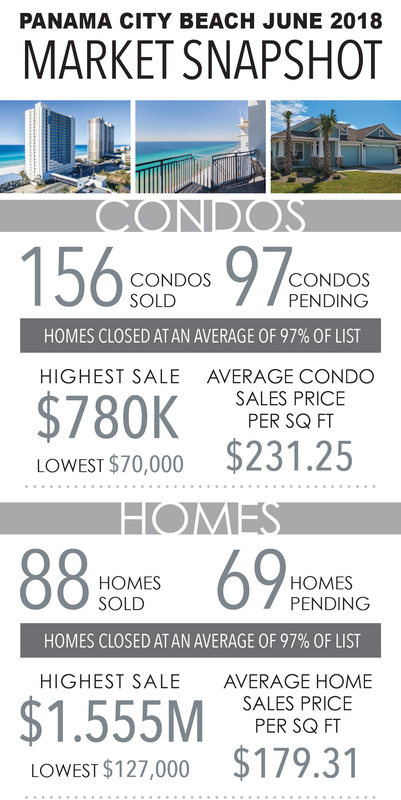 The highest priced condo closed at $780,000 while the highest single family home closing was at just over $1.5 million. Scroll below for an overall recap of residential sales activity for both condominiums and single family homes. Interested in MORE Market Data? *Market data for 6/1/18 to 6/30/18 as of 7/13/18. Information reported is deemed reliable but is not guaranteed. © 2018 MLS and FBS.